In Arahova you will find "Taverna Gerontovrahos", a delightful restaurant where you can come and enjoy a freshly prepared and very tasty meal. Parnassos is a beautiful region of Central Greece, and is home to a fantastic ski center. The name of our taverna, Gerontovrahos, means "old rock" and is also the name one of the hills on Mount Parnassos. Whenever you choose to visit Parnassos, you will always be able to come to us for a meal as we are open all year round, for either lunch or dinner. 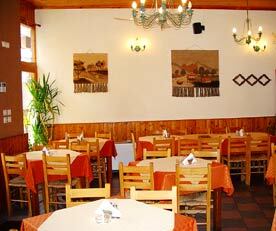 Our taverna is a family business, and we pride ourselves on the excellent service and quality of meals that we offer. We also offer very friendly prices. 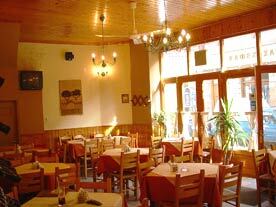 In our delightful taverna, with its simple yet cosy atmosphere, we are sure you will have a great and memorable time with us. We offer a wide choice of traditional Greek cuisine, as well as barbeque, with such dishes as "kontosouvli" and "kokoretsi". Our speciality is called "Tripa Yemisti", which is pork stuffed with herbs chesses and other secret ingredients. If you decide to have a meal with us here, you must try this dish. All of our food is carefulyl prepared with the finest and freshest ingredients. All of our meats are Greek, and are not imported.